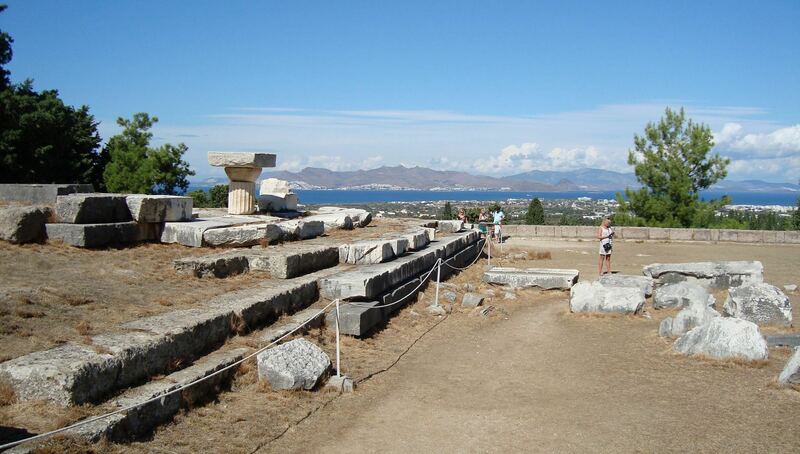 The Asclepeion of Kos is one of the most impressive sanctuaries consacrated to Asclepius, the greek god of medicine. In AD 554/551 a terrible earthquake, described by the historian Agathias Scholasticus, hit the Asclepeion, that remained buried for about 1350 years. 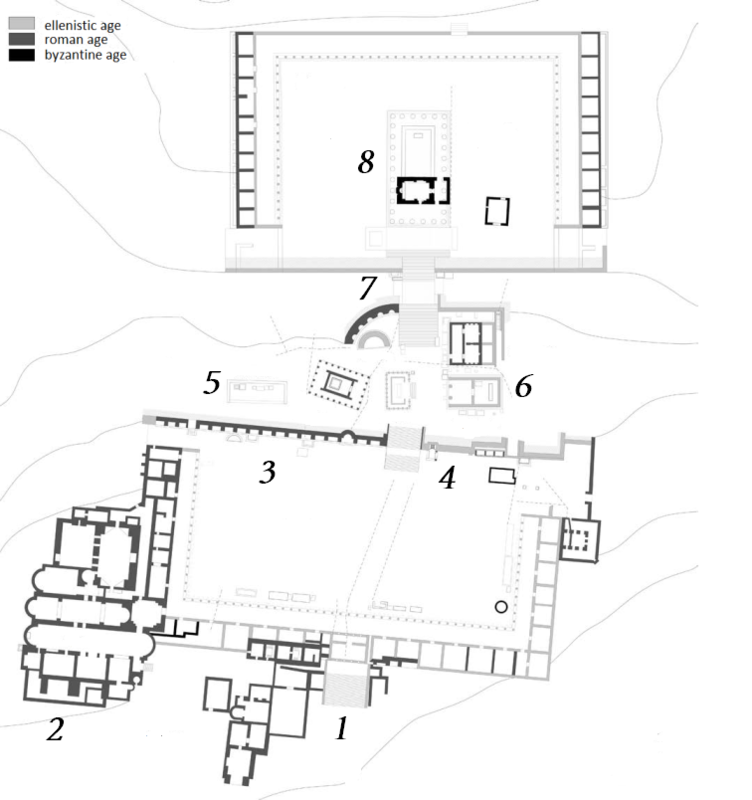 The ruins were then discovered by a German doctor of Literature, Rudolf Herzog, with the significant help of Iakobos Zarraftis on October 9th, 1902. The reason for the excavations was the discovery, in 1891, of an Egyptian papyrus in which was testified the existence of sculptures and paintings of the Asclepius' temple in the famous Asclepeion of Kos. 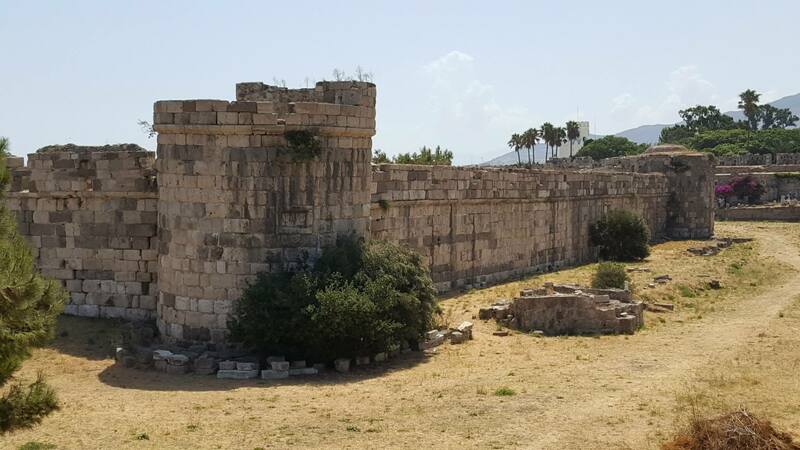 However, were the Italians that had the merit of restoring and securing the site. In fact, in 1928 Luciano Laurenzi, an Italian archaeologist, started excavations in the lowest level towards the east side of the first terrace (andiron) and managed, in 1930, to find the Roman Thermes (baths), only a part of what had been discovered by Herzog. 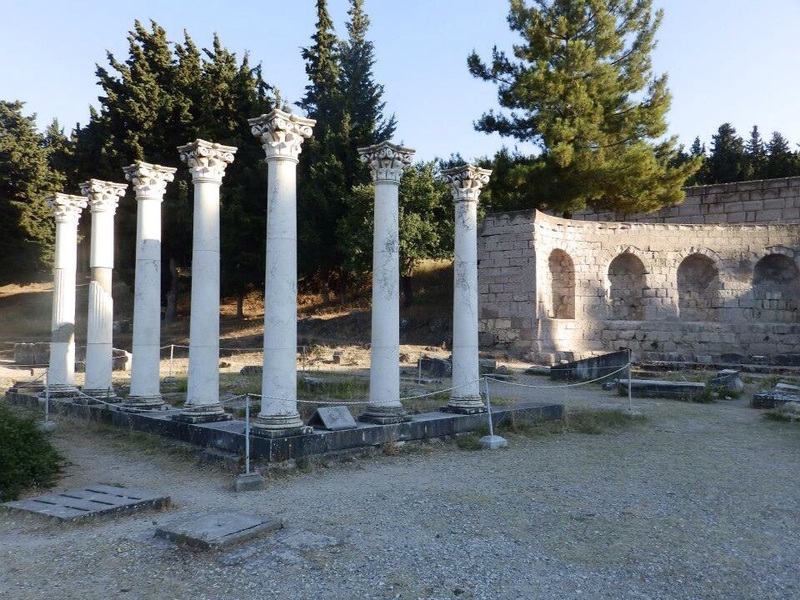 The origins of the Asclepeion are traced back to the 4th century b.C. (in the ages that are commonly known as the Hellenistic and Post Hellenistic periods), as it is shown by the three terraces (andira) that were an Oriental element adopted by Greek tradition after the conquest of Asia by Alexander the Great. In order to easily find the monuments we are going to describe, look at the following pictures and the number indicated in each title. 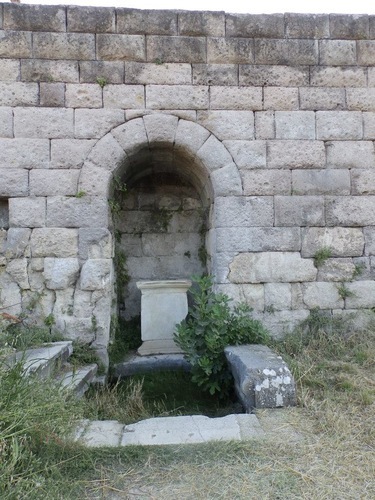 Original pictures from D. De Mattia, "Il tempio romano dell’Asklepieion di Kos: nuovi dati per la sua anastilosi"
The three levels were connected by a marble staircase. Parts of the ancient stair can still be seen. 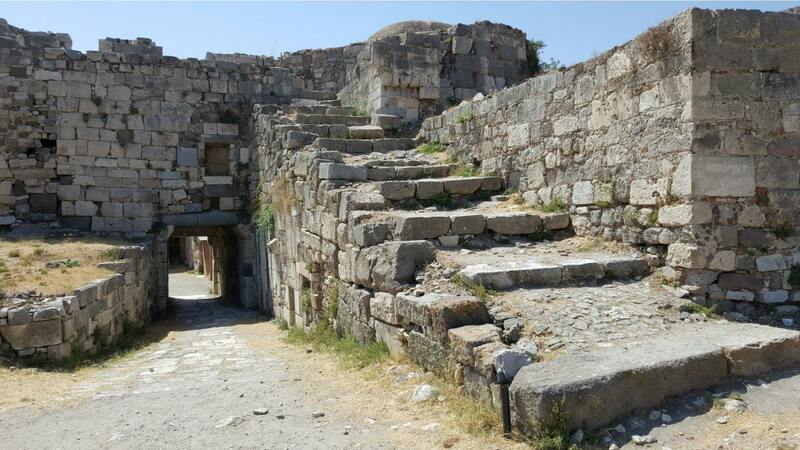 In fact, today, visitors can climb the 113 wide steps of the marble staircase that leads to the three successive terraces. On the first terrace there are the "Thermes", remains of baths of the 3rd century AD. 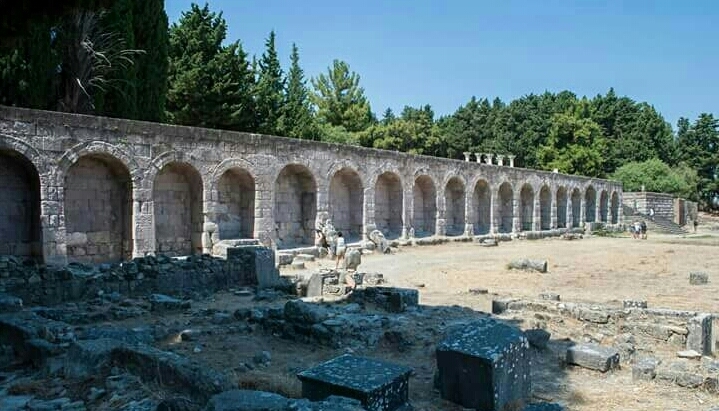 Their construction was intensely influenced by Roman architecture, as it is evident from the long arched walls. A short distance to the west there are the ruins of baths, that included the three typical rooms of the tradition: calidarium, frigidarium, tepidarium. The pools, that have marble floors, and the heated rooms can still be seen. 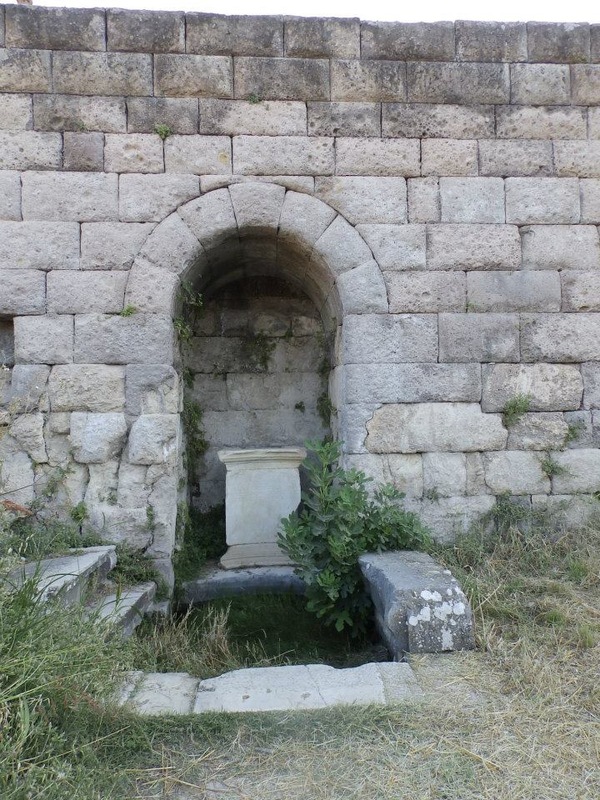 According to achaeologist Laurenzi, these baths were made of materials taken from a hellenistic building which “might have been standing in the very same place”. The right side of the first terrace hosts an arcade and behind it there was the statue of the Nike and other votive statues depicting the sick or diseased body parts. According to some archaeologists, in this area there was the temple of Aphrodite with the famous statue of Prassitele. 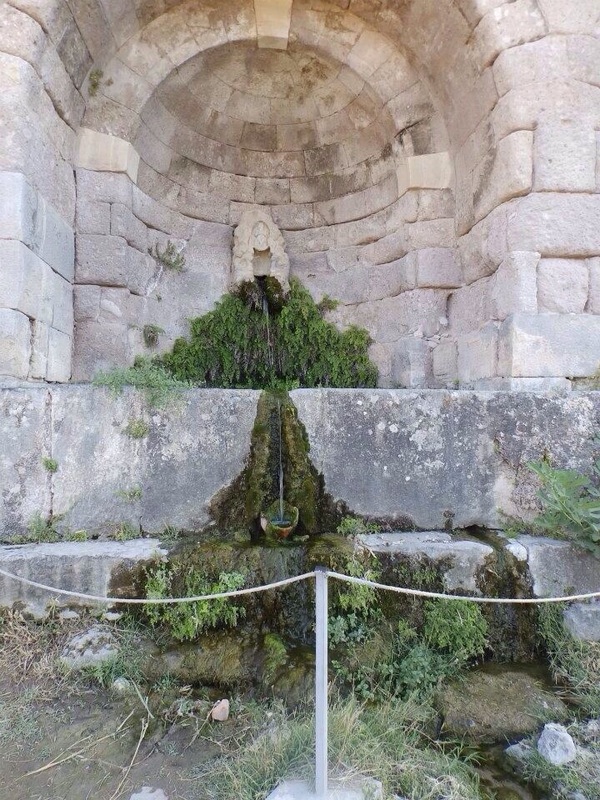 To the left of the staircase of the first level, there is a statue of the god Pan, with his pipe, while the water flows under his feet. 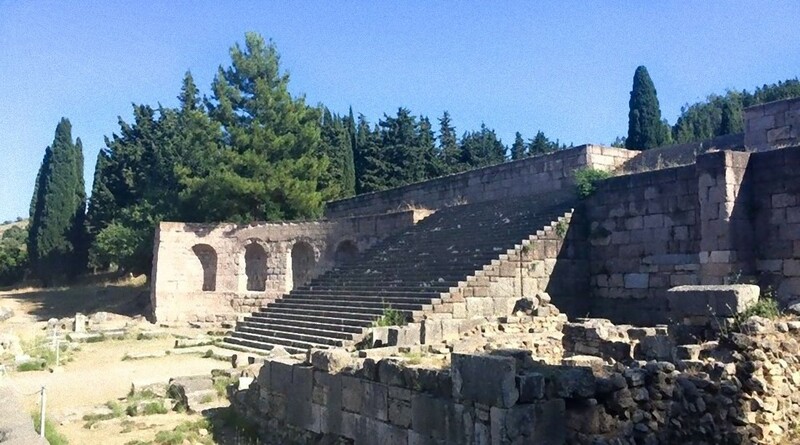 To the right of the staircase there is an inscription of a small temple of the famous physician Gaius Stertinius Xenophon, who was the personal physician of Emperor Claudius. 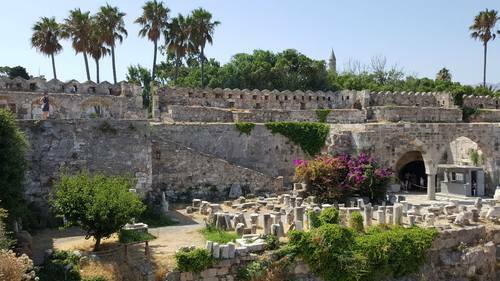 Beside the external walls of the upper terrace you can find the so called "temple C". Numerous researches conducted by Wolfgang Ehrhardt sentenced that, once realized the temple in the 3rd century BC, it became evidently necessary to rebuild the themple C on the basis of a new orientation, this time with a front open to the east and almost perfectly aligned with the adjacent temple. The plan outlines a construction of the type oikoi, a diagram which provides two rectangles placed side by side, with the major axis oriented approximately in the east-west direction. 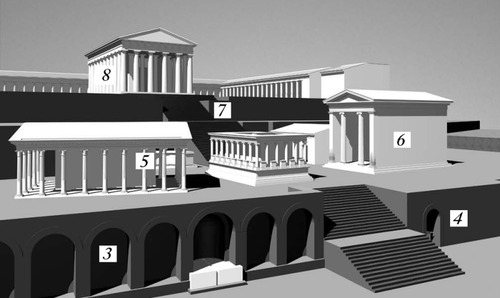 Rebuilt by Herzog with four columns in antis, the colonnade had to be Doric, as demonstrate the elements of the stylobate. 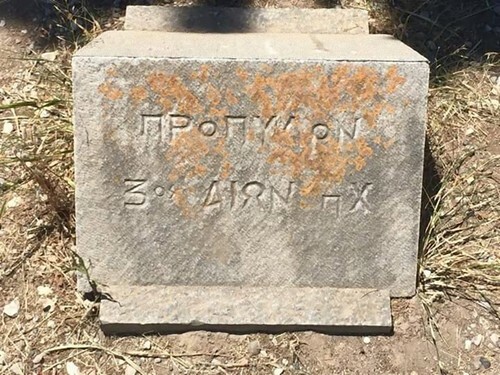 The capitals can be dated back to the 3rd century, as it is attested by several comparisons with contemporary monuments of Kos. The shaft of the column, as it appears from the collar, refined in the same block of the capital, was punctuated by twenty grooves from profle rather flat, large 7-7.5cm, separated by sharp edges as they were discovered, according to one of the semplification plan that was typical of that period. 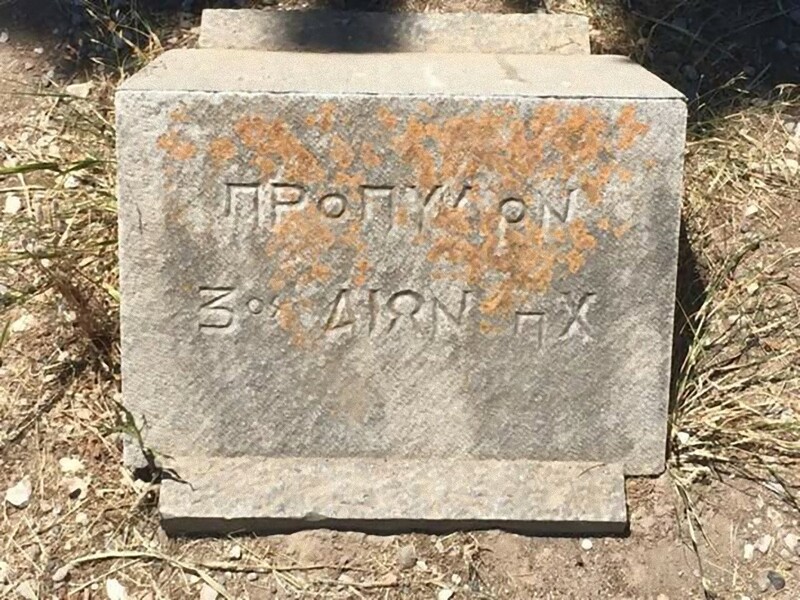 The Greek inscription reads as follows: "Propileon/ Kos Dion Ek"
The third terrace hosted a Ionic temple of Asclepius, that had a central role in the ritual. 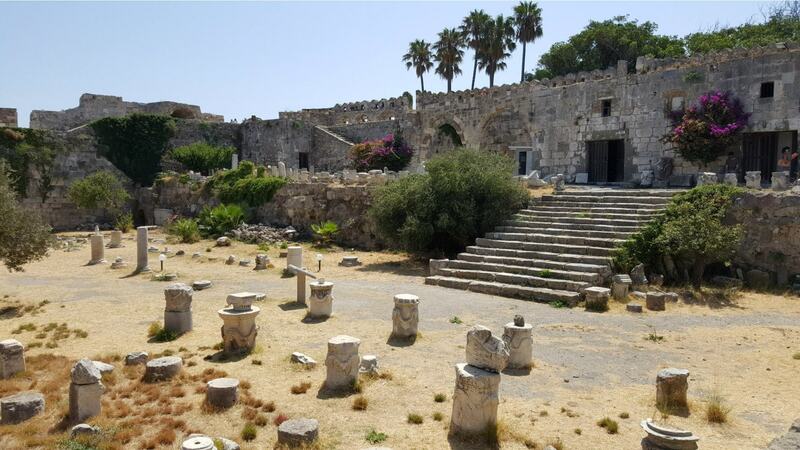 The cella of this temple was used as a "treasury" and patients and visitors would drop their offerings into it. 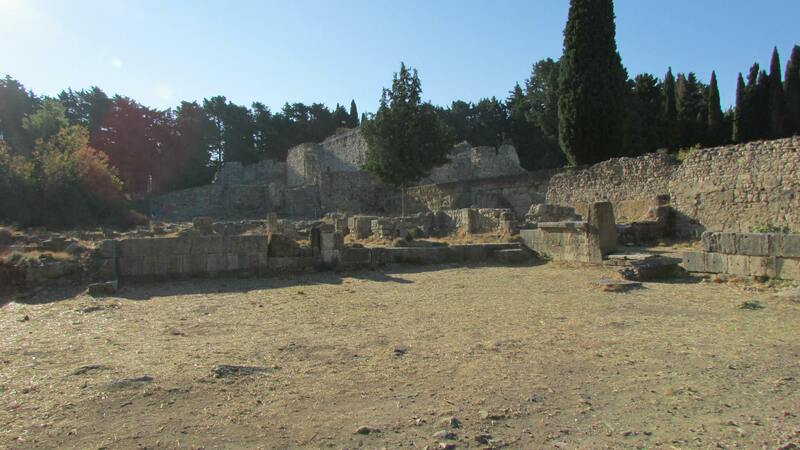 In the middle of the terrace there are the remains of an Altar dated back to the 3rd century BC. It had a rectangular marble shape with sculptural decorations. This altar constituted the benchmark of the Asclepeion. The altar was reached up a slope from the west, making it easier for people to carry the sacrificial animals. 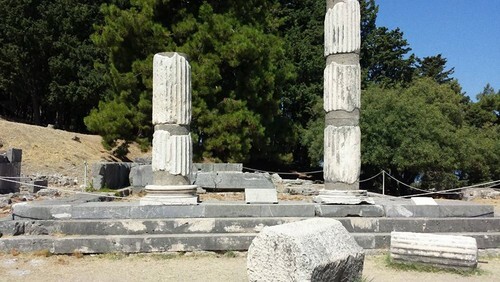 There was a small colonnade around it, and next to this there were the famous sculptures of the sons of Praxiteles. At the top of the terrace there is a sacred grove, where, according to Pausanias, “nobody was allowed to be born or die”. 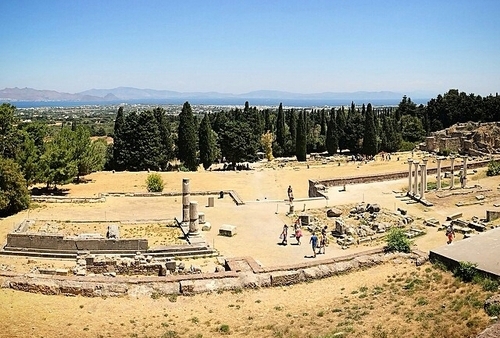 Another particularity of this unique sanctuary is that the cutting of the cypress-trees was forbidden, as ancient inscriptions stated. It is known that the sacrilegious senator Poplius Turullius (31 BC), one of Julius Ceasar's assassins, was sentenced to death because he had cut trees to build ships for the Roman fleet.